Nantucket, the tiny island so frequently veiled by soft swirls of mist that it is nicknamed The Gray Lady, is shrouded with romantic tales of myth and mystery. While Nantucket’s rich history as one of the world’s most important whaling ports is still a key part of its identity (don’t worry, whaling is very much a thing of the past for this little island), these days it is considered the ultimate escape when it comes to East Coast elegance. Home to superb eateries, quaint shops, activities that include golfing, biking, and sailing, and an ever-growing number of festivals and parties, it is easy to see why everyone from blushing brides to business tycoons – not to mention sports personalities, political power players, and movie stars – have claimed Nantucket as their special place. With 10 gorgeous beaches lining the island and miles of well-kept bicycle paths, finding a piece of this hydrangea-dotted island for oneself, perhaps with a bottle of the local Whale’s Tale Pale Ale, is still very much a reality. But where to stay…? There are no properties that define the island experience more perfectly than Nantucket Island Resorts. We recommend staying in more than one, if time allows. The White Elephant is one of Nantucket’s best-known hotels. Overlooking Nantucket Harbor, it is a favorite location for romantic weddings and family getaways alike. The White Elephant Hotel Residences are a sparkling homage to the classic Nantucket aesthetic of nautical colors and relaxed luxury. Featuring a pool and complimentary bikes it is ideal for families and longer stays. 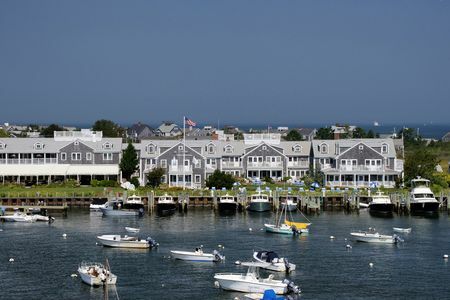 The Cottages and Lofts at the Boat Basin, including the pet-friendly WOOF Cottages, are snug enclaves perched over the Nantucket Boat Basin. The very height of windswept romance, The Wauwinet is a Relais & Chateaux property. Situated amid some of the loveliest natural scenery at the eastern end of the island, the inn’s antique-furnished guestrooms overlook the ocean and bay. And for a true throwback to the island’s golden age of whaling, there is the Jared Coffin House, one of Nantucket’s original brick mansions, located in the heart of historic downtown.